South Middle School students also celebrate Start With Hello and fundraise for Memorial Sloan-Kettering Cancer Center. 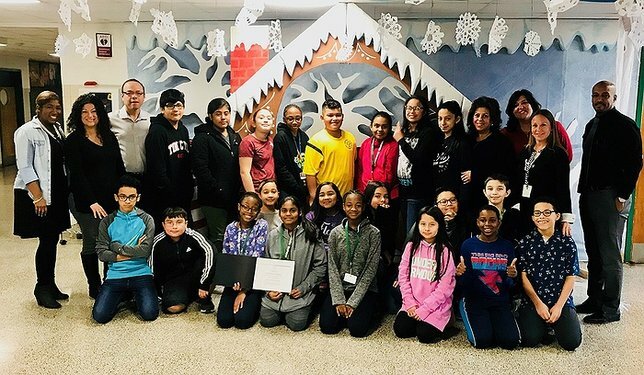 The Brentwood Union Free School District’s South Middle School was recently awarded a Citation of Merit from the Memorial Sloan-Kettering Cancer Center (MSKCC) in recognition for the generosity of students and staff in the building. Together, students and staff raised a total of $282 to donate to Memorial Sloan-Kettering Cancer Center. Brentwood, NY - January 14, 2019 - The Brentwood Union Free School District (BUFSD) is thrilled to share that South Middle School was recently awarded a Citation of Merit from the Memorial Sloan-Kettering Cancer Center (MSKCC) in recognition for the generosity of students and staff in the building. The fundraising effort was part of the school’s celebration and participation in the Start With Hello initiative, spearheaded at South Middle School by Kathleen Barber, social studies teacher at the school. The initiative, an outgrowth of the Sandy Hook tragedy, looks to create a culture of inclusion and acceptance. Throughout the month of October, students and staff made colorful ribbons for Breast Cancer Awareness Month and Bullying Prevention Month to sell in the guidance office and throughout lunch periods. With the help of family and friends in the district, South Middle School’s students and staff were able to fundraise a total of $282 to donate to Memorial Sloan-Kettering Cancer Center. In addition to the fundraising, the school’s celebration of Start With Hello included teachers reading positive affirmations and messages each morning to their classes. Students also helped spread kindness by writing encouraging words on Post-It notes that were hung in the cafeteria. For more information about the Brentwood Union Free School District, please visit the district’s website at www.brentwood.k12.ny.us. Happenings in the district can also be followed on Facebook at www.facebook.com/BrentwoodUnionFreeSchoolDistrict. Subject: LongIsland.com - Your Name sent you Article details of "Brentwood’s South Middle School Fundraises for Memorial Sloan-Kettering Cancer Center"